Harper's Bazaar, June 2008, p58. Finally! I was overjoyed when I saw that the June issue of Harper's Bazaar included cameos among the Fall 2008 "Must" accessories. Aren't those Giuseppe Zanotti booties divine?! 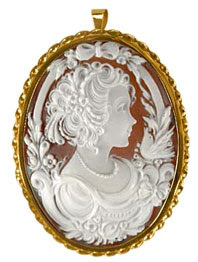 I've loved cameos since I was little — my mom had a cameo brooch which I would lovingly gaze at in her jewelry box and, when I was older, was allowed to borrow occasionally. 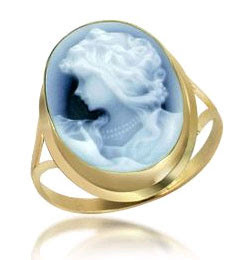 In 1999, while living in Italy, I bought my first own cameo, a mother-of-pearl cameo marcasite ring. 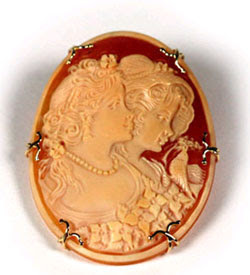 A cameo is a piece of jewelry carved into relief, usually with a contrasting background — your own miniature sculpture, if you will. 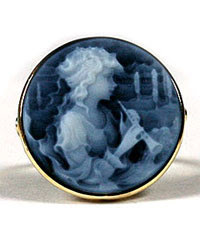 The earliest cameos date to the 6th century BC, but the heyday of the cameo was the Victorian era. 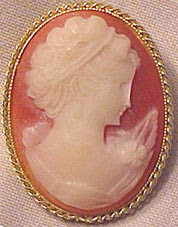 The most common materials for cameos are carnelian shell, agate, onyx, coral, and mother-of-pearl, but rare stones, glass, and even jasperware cameos abound. 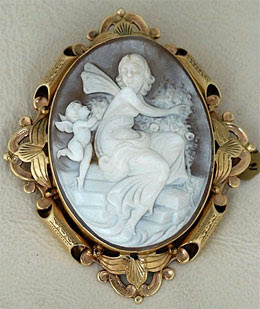 The most common theme for cameos is the so-called "Lady Cameo", but mythological, historical, religious themes, and flowers are also popular subjects. 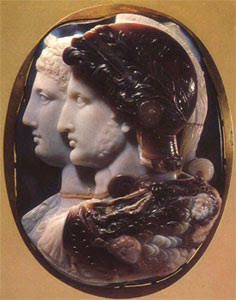 "The Gonzaga Cameo", 3rd century BC. I'd love to do a Glam Guide Cameo Trip to the jewelry stores that line the Ponte Vecchio in Florence, but since that isn't an option, I'll share a few tips and links to a few lovely pieces that can be purchased online. When buying cameos, online and in stores, you have to be careful. You can find them quite cheaply in many online stores and on eBay, but there are dangers. Often poor quality materials and sloppy construction are sold at outrageous prices, but when you get it home, horrendous disappointment. 1) If it seems like too good a deal, it is. 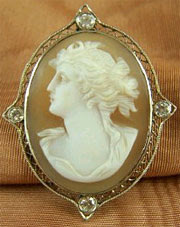 NEVER buy a cameo under $50, preferably nothing under $100. The only exception is if you're buying costume jewelry quality — for example Tarina Tarantino does lovely costume cameos. But in fine jewelry the saying "you get what you pay for" holds fast. 2) The more intricate the carving the better. Especially on eBay you will see lots of cameos boasting to be "authentic Italian" or "antique", when in reality they are sub par. Your best bet is to visit local jewelry and antique stores and to avoid eBay and bargain outlets until you feel you have a trained "cameo eye." 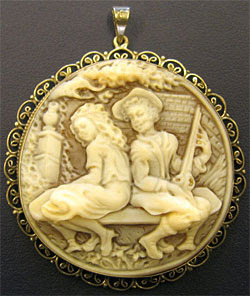 Sterling Silver & Shell "Pastorale"
1. Harper's Bazaar, June 2008. 2. The State Hermitage Museum, St. Petersburg, Russia. All product images from their respective sellers. Cameos are gorgeous and I am in love with those shoes in the very first pic! I found the CUTEST cuff bracelets on etsy and this girl has several with cameos and they are so cute! I've bought 3 bracelets from her and I love them all!
" drunken blind men in the third world countries far away "
You are so ignorant. Don´t talk about what you don´t know. There are thousands of fine jewelry in the third world specially in Brasil. We have wonderfull artists that sell theirs creations to the best stores in Europe and US. Your words are an example of prejudice. 1) I never thought of Brazil as a third world country. I am not ignorant of the merits of Brazilian artisans, not only in the fine jewelry field, but also in leather goods, fashion, and fine arts. 2) You are right, I am biased to prefer cameos made in Italy and Greece to cameos made by poorly trained people, anywhere -- I prefer artisanry to cheap, unskilled labor any day. My prejudice is based on an informed difference as to quality, not out of ignorant prejudice toward a certain people or countries. I prefer real-deals to knock-offs anytime.. But cameos are not my thing.. But how about those Guiseppe Zanotti shoes? They're fabulous! What gorgeous Pastorale - really sublime. I need some thing new and more images. I *love* cameos! I use them on occasion in my jewelry design. I'm very excited that they've made a fashion comeback!